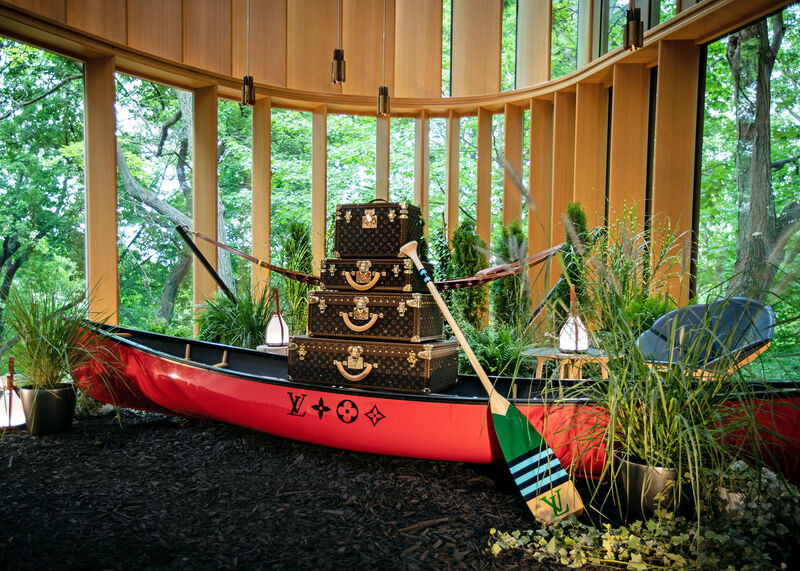 A special Canadian-inspired Louis Vuitton display at Integral House. 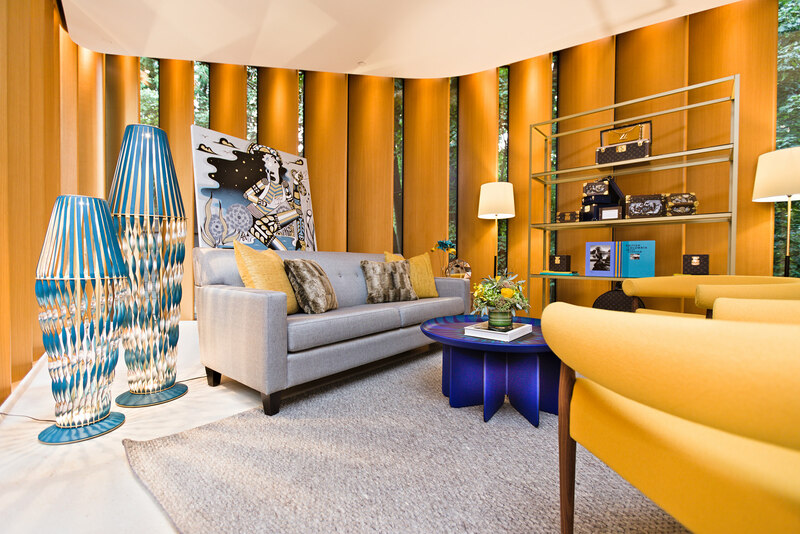 Cocoon by Brazil’s Campana Brothers for Louis Vuitton Objets Nomades, at Integral House. 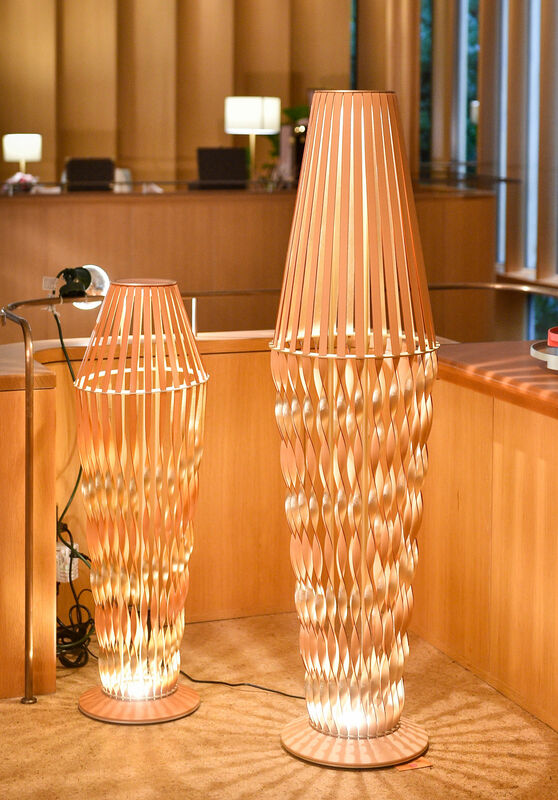 Spiral Lamps by Switzerland’s Atelier Oï for Louis Vuitton Objets Nomades, at Integral House. In 2009, James Stewart moved into the house of his dreams. 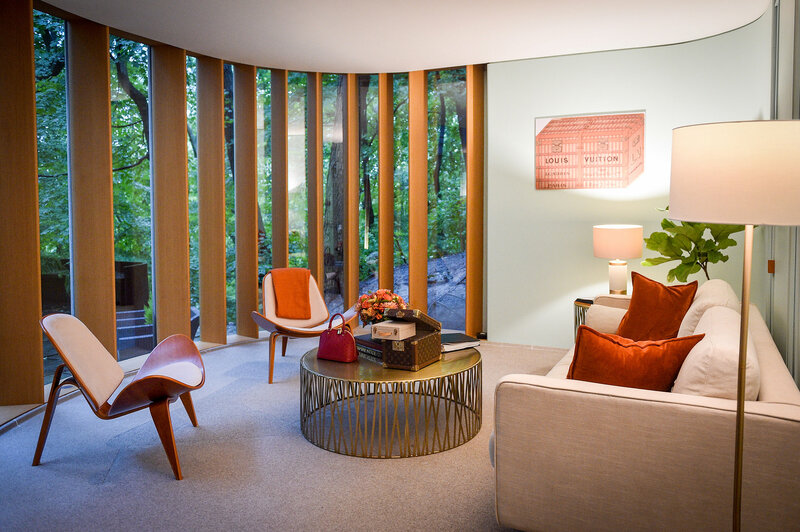 The calculus textbook author and violinist commissioned Shim-Sutcliffe Architects to create what he called Integral House, a five-storey abode in Toronto’s posh Rosedale neighbourhood: a place where he could host extravagant events for both his personal network and the greater community. With a curving yet geometric body, large windows flanked by smooth wooden panels, and breathtaking columns and beams, Integral House is a truly exemplary interpretation of contemporary architecture. Overlooking a lush ravine, it feels not just connected to its surroundings but part of them entirely. Stewart, whose love of math and music informed the construction of the space in terms of its layout and acoustics, lived in Integral House—which has become one of the most famous private residences in Toronto—until he died in 2014; it was sold two years later to Canada Pension Plan Investment Board CEO Mark Machin and his wife, Melissa Mowbray-d’Arbela, a strategy consultant and investor. 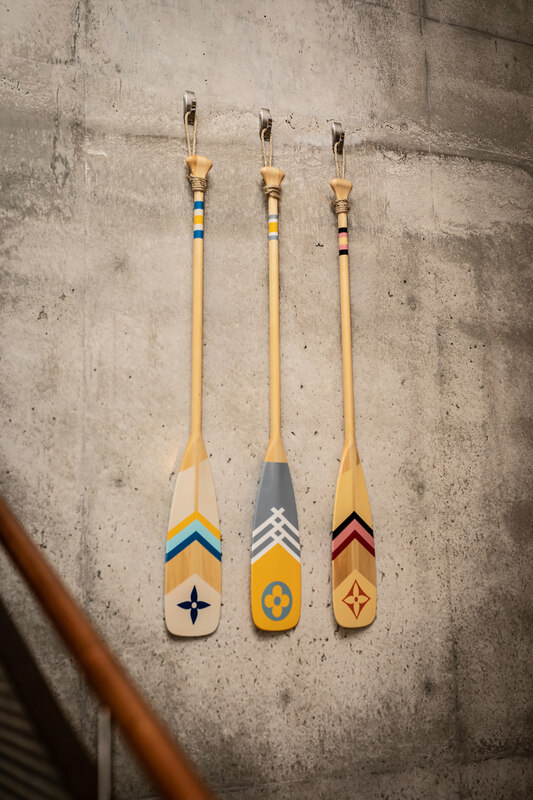 When the sale was announced, Machin and Mowbray-d’Arbela made it clear they wanted to continue Stewart’s legacy of using the home as a community space for special arts and culture events. 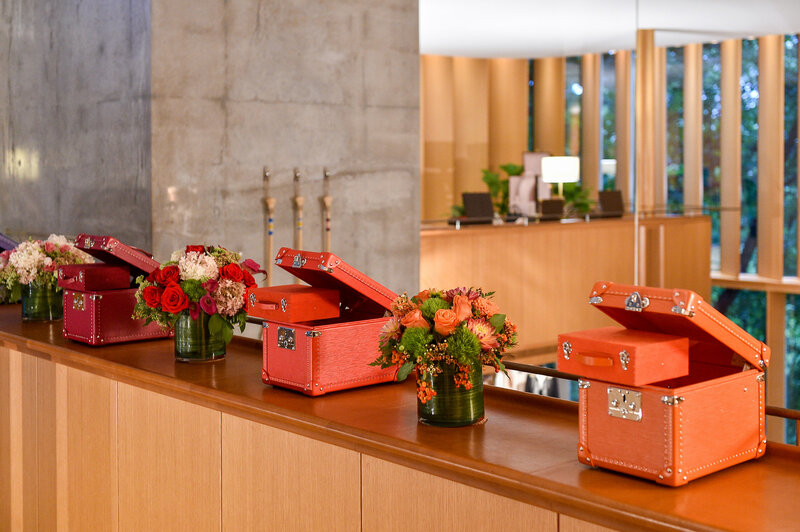 Which brings us to 2018, during the Toronto International Film Festival and Toronto Fashion Week, which also happened to mark the 35th anniversary of Louis Vuitton’s entrance into Canada. 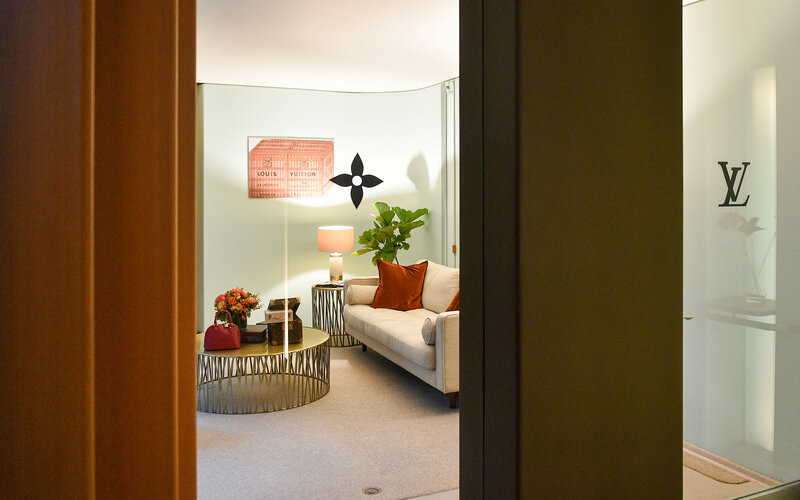 And the luxury French maison sure celebrated in style—both with a free heritage exhibit outside Toronto’s Union Station, and with an exclusive, by-invitation-only display at Integral House. There, among the sheets of natural light that filter though the windows, amidst the limestone flooring and the custom light fixtures and the sense of calm that seems to live within this home’s very bones, sat a striking arrangement of Louis Vuitton’s Objets Nomades and Les Petits Nomades collections. 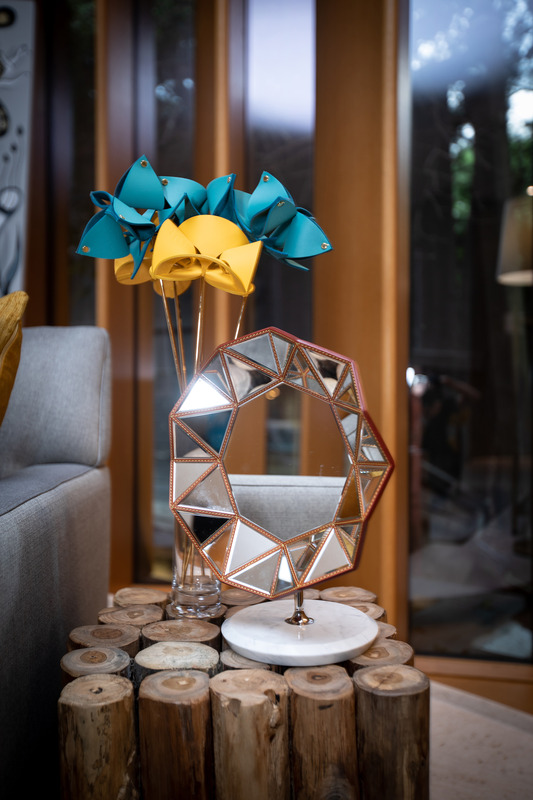 Launched in 2012, Objets Nomades is the brand’s foray into furniture; Les Petits Nomades is its offering of smaller home accessory items, such as vases and decorative flowers. 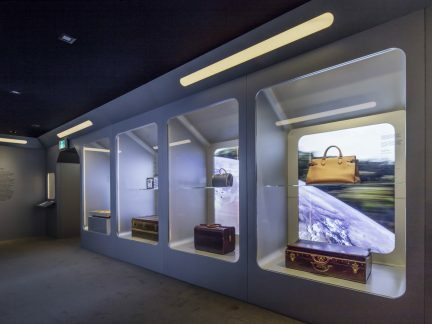 Tapping some of the design industry’s greatest minds—from Marcel Wanders to Patricia Urquiola—Louis Vuitton creates special limited-edition offerings that centre around some of its historical codes: travel, leather, and craftsmanship. 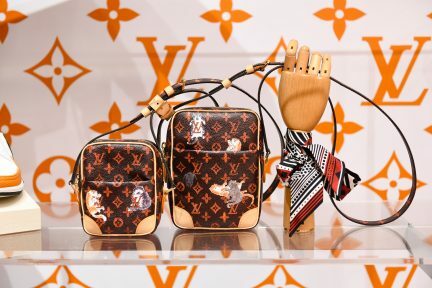 That means pieces are designed to be transportable, and are made in Louis Vuitton’s Asnières workshop just outside Paris or by artisans in Italy. 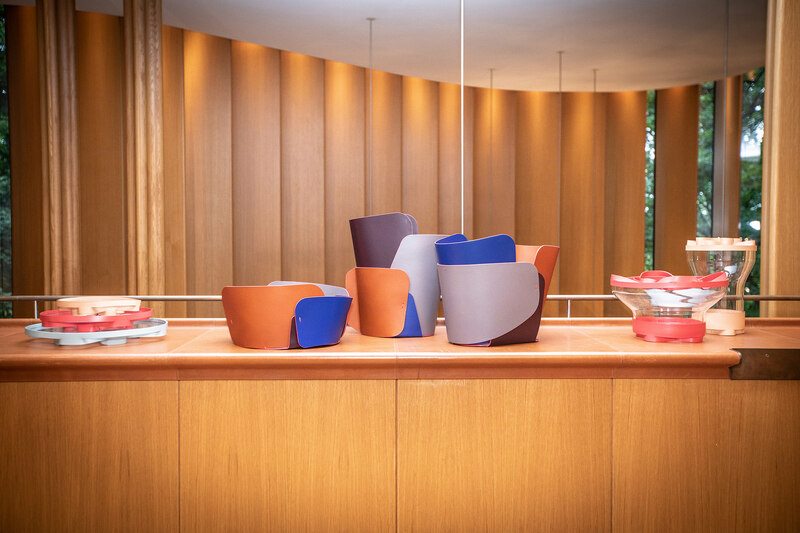 And while the collections were only on display at Integral House for one week, the occasion stamped the Canadian debut of Objets Nomades, which is now available at the brand’s Bloor Street store in Toronto. 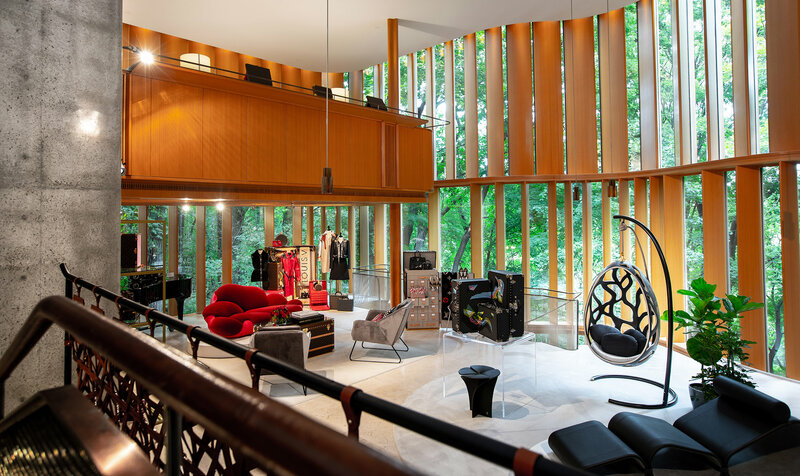 If the success of the Integral House showing is any indication—indeed, some pieces sold right on the spot—then Canada is very much ready for more Louis Vuitton. 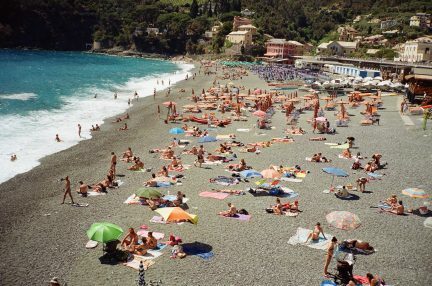 And how could we not be? 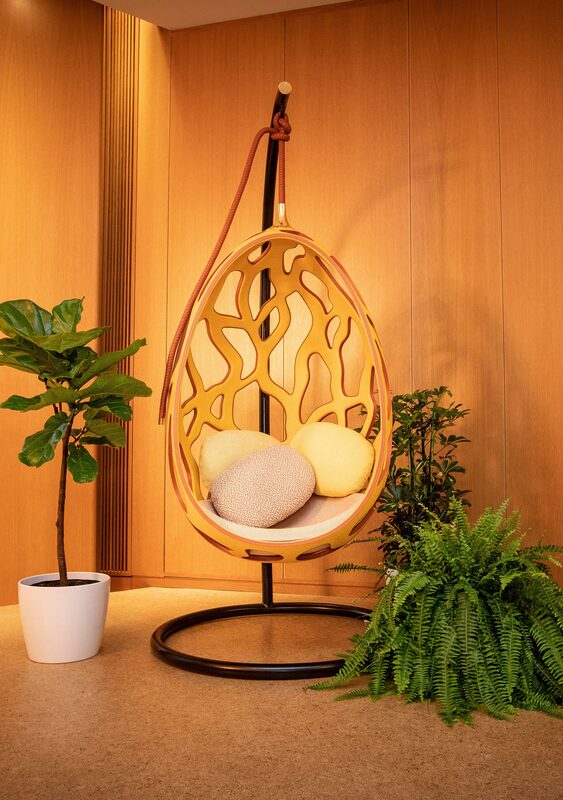 One glimpse of Cocoon, an oval vacuum-moulded fibreglass swing chair designed by Brazil’s Campana Brothers, is sure to get hearts racing. 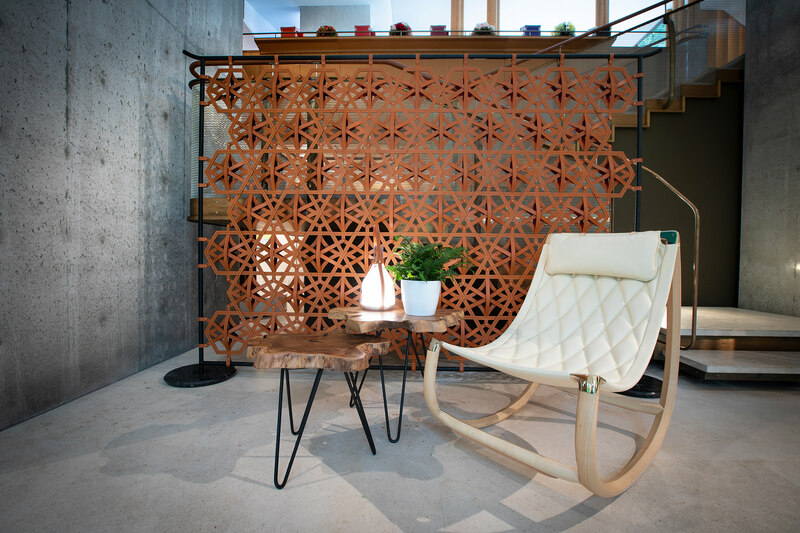 Hanging from a gilded steel and brass hook, the swaying chair has a calfskin exterior and a quilted leather interior, plus complementary broadcloth-covered cushions. Available in multiple colours, it is an elegant yet playful addition to any room. 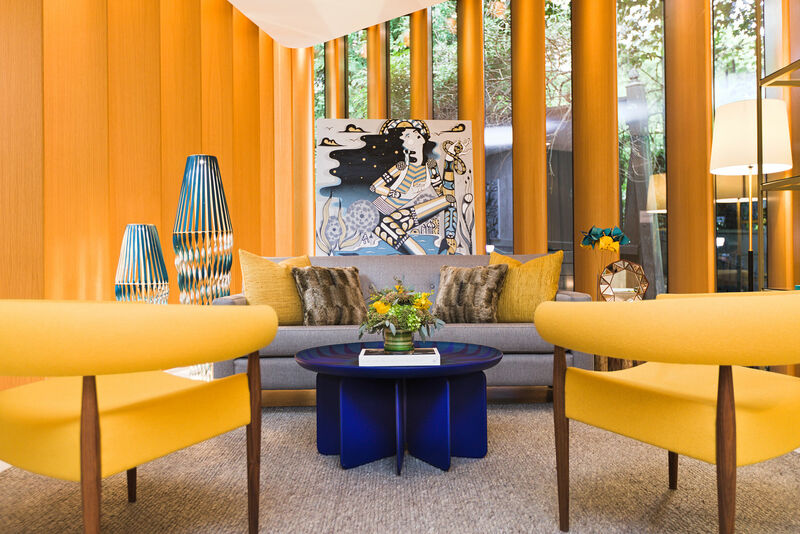 Or there is Iranian designer India Mahdavi’s Talisman Table: an arresting circular coffee table made of dozens of blue and black leather pieces sewn together like a mosaic. 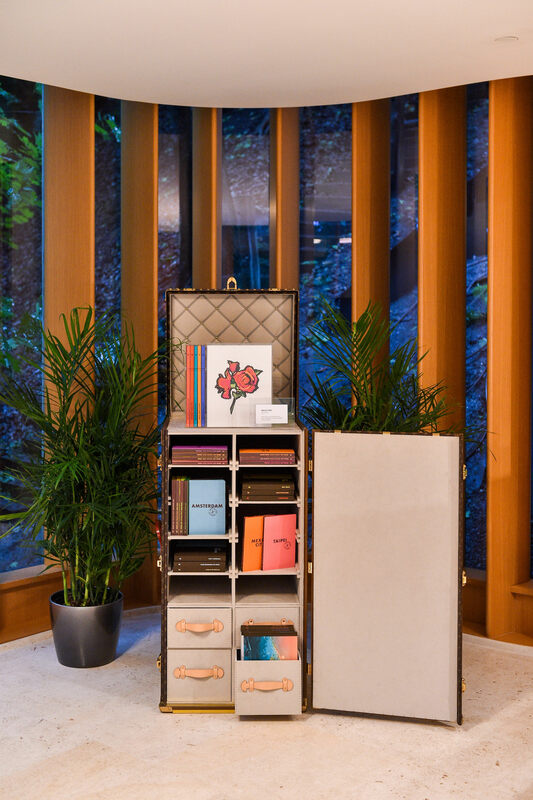 With a removable tabletop that doubles as a tray, the bottom stand folds up like a book for easy carriage and storage. It brings functionaity to the forefront of a space. Further following Louis Vuitton’s themes of leather and travel is the Tabouret stool by Switzerland’s Atelier Oï. 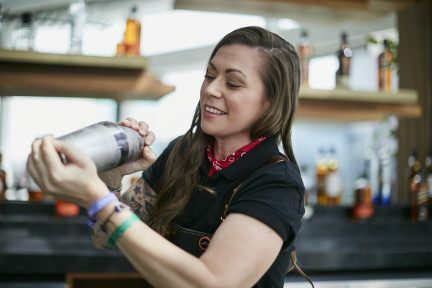 Perfect for additional seating at a busy cocktail party or for taking to that glamping site on Vancouver Island, the stool folds up flat and comes with its own carrying strap. 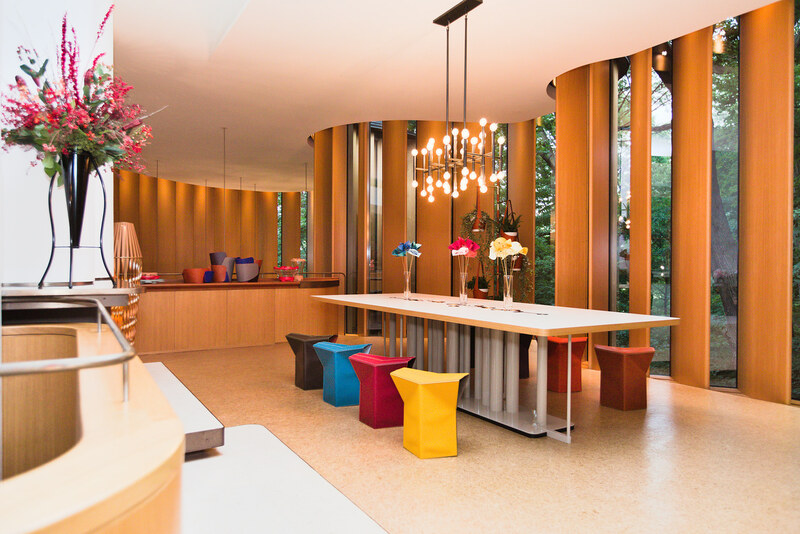 When spread out, its origami-style elements (an aluminum core wrapped in soft Nomade leather in colours such as orange, pink, purple, yellow, and blue) are simply pressed into place. Speaking of glamping, those who enjoy forest walks at dusk or who want to set an enchanting ambience at dinner will enjoy London duo Barber & Osgerby’s simply-titled Bell Lamp. Cordless and solar-powered, this lantern-style frosted glass piece emits a warm glow—thanks to LED lighting that comes with four brightness options—from its bell-shaped body. Wrapped in a brown Nomade leather strap, it can be carried anywhere, softly illuminating whatever path lies ahead. From Les Petits Nomades, an octagonal Diamond Mirror mounted on a brass stand and marble foot, by famed Dutch designer Wanders, adds depth and radiance to quiet corners; and Italian heavyweight Urquiola’s Overlay Bowl, created with sheets of coloured leather that intersect into one harmonious and orderly basket, inserts youthful boldness and a touch of whimsy. 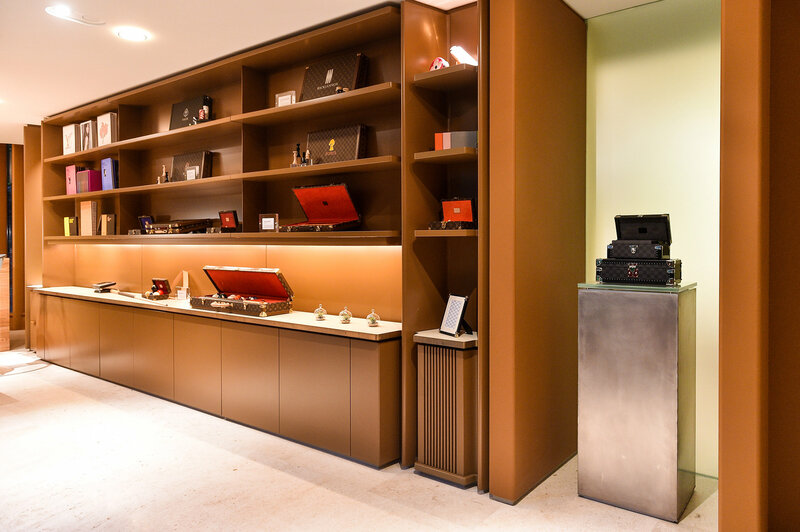 Viscerally encapsulating such ingenuity, artisanship, and attention to detail, these Louis Vuitton pieces are perhaps the perfect match for Integral House. Through this display, Stewart’s vision for a gathering place of art, creativity, and style certainly continues to be realized.